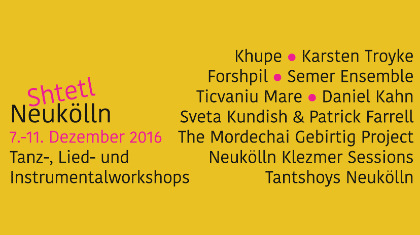 SHTETL NEUKÖLLN is the first Festival of Yiddish Culture with Berlin musicians and Neukölln venues. Five days, from the 7th - 11th of December 2016, filled with concerts, sessions, Klezmer dance ball, as well as workshops on the topics of Klezmer dance, Yiddish songs and instrumentals. What’s more, the multimedia project celebrating the 140th birthday of the Yiddish poet and songwriter Mordechaj Gebirtig will be presented during the festival. Jewish life has come back to Berlin and Neukölln has become the home and ocal point area of many young, international Klezmer musicians. 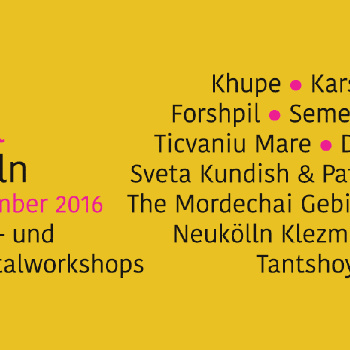 Piranha recording artists, Semer Ensemble as well as its members seperately, Sasha Lurje and Daniel Kahn, are going to perform at Shtetl Neukölln on Friday 9th and Sunday 11th of December. The festival is taking place at Werkstatt der Kulturen. Click here for more about the event & registrations.